I started running about 18 years ago while struggling with depression. It was my therapy in many ways. After receiving severe injuries in 2004, I didn’t know if I would ever run again. But thank God! After dozens of surgeries and years of physical therapies, I began running again in 2008. All I can say is there is just something about running that works for me – body, mind and spirit. 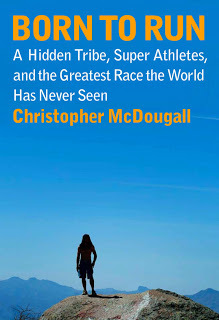 Recently, I heard Christopher McDougall speak at a local college – he’s a great speaker and writer. Born To Run is a great read – whether or not you’re a runner. I also enjoyed the book for the look into the world of the Tarahumara Indians and their culture. McDougall has a interesting reason as to why we like to run. All our bodies need exercise to stay healthy – if you don’t use it, you lose it. So even if running doesn’t appeal to you – this book will inspire you to do something for your health. Leave your name (and a way for me to contact you) for a chance to win a copy! Closes Thursday at 9PM – Winner posted on Friday. “Hind” you won last week’s book, I have no way to contact you -email me! AWESOME! I've been wanting to get this book but forgot. Great review with the video. Sounds like a great book. I could use some inspiration. Thanks for offering it. This looks very interesting and inspiring. Great review! Looks like a great book! You're awesome Janet!! Congratulations Michelle – you are the winner! Sorry the rest of you didn't win – but go buy or borrow a copy and read it, it's a great book! Thanks for another Winning Wednesday, Janet. I plan on getting this book today.